Mt. 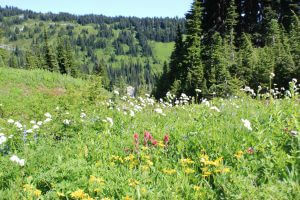 Rainier is a hiker’s paradise. Choose from a variety of trails, from flat and relatively simple to steep and challenging, or scale the mountain if you’re so inclined. The hardest part for me was picking the time of day for optimum photo opportunities. Make Sunrise your first early-morning stop, when the eastern glaciers glow in the morning light. At 6,400 feet, Sunrise is the highest vehicle-accessible point. The trails rise from the Visitor Center. 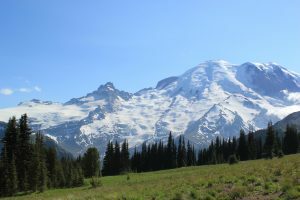 They take you above the timberline and drop you face-to-mountain-face with the magnificent Rainier, or Tahoma, as the native Yakimas named the mother of all rivers. From Sour Dough Ridge to Dege Peak you will see Mt. Adams and Mt. Baker and understand how Mt. 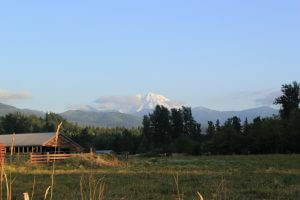 Rainier links into the chain of volcanoes forming the Ring of Fire. 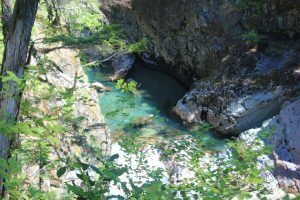 A good hike for noontime takes you along the Ohanapecosh River to Silver Falls. The high sun shines directly into the narrow canyon, teasing out the emerald green of the water and illuminating the falls. The trail can be steep, but the view from the bridge is lovely. From here you can hike or drive to the Grove of the Patriarchs on Stevens Canyon Road. 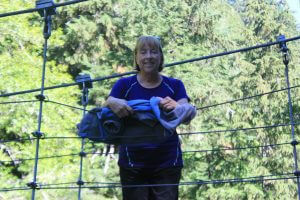 A hike along the Ohanapecosh River takes you across a swinging bridge to an island. 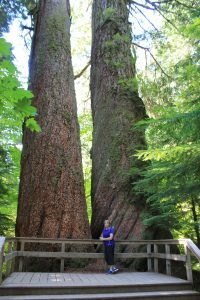 There, a boardwalk trail winds through a majestic old growth forest, reminiscent of the giant Sequoias in California or the Cathedral Grove on Vancouver Island. 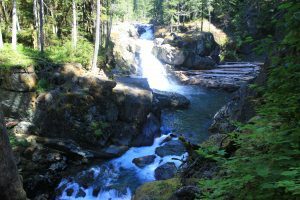 For serious hikers, the 93-mile Wonderland Trail, considered world-class, covers a large area of the park and shares parts of the Pacific Crest Trail. The casual hiker can attack Wonderland in segments over a number of days or years. 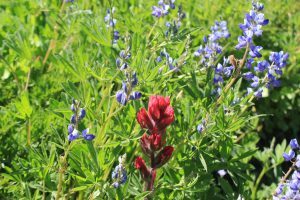 Late July and August are inspirational at Paradise, where the wildflower trails feature a palette of colors fanning out below Mt. Rainier. Rosy spirea actually smells like roses. Ask this bee. 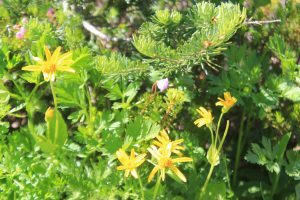 Broadleaf Arnica, a medicinal plant used for healing bruises. 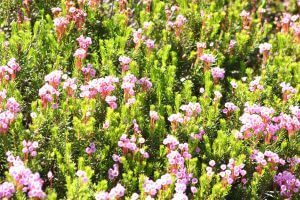 Pink mountain heather, between 50 and 200 years old. the accommodations were—how shall I put it—vintage motel? If you want the full National Park experience, stay inside the park. 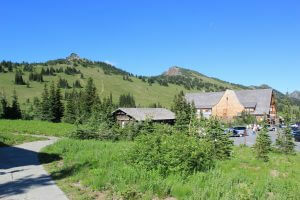 Built near main hiking attractions, park accommodations not only allow access to solitude during the uncrowded hours of the day, but they also get visitors out of their cars to decrease our carbon footprint. 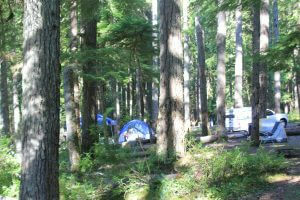 Campgrounds like the Ohanapecosh are basic but well situated. A river runs through it. 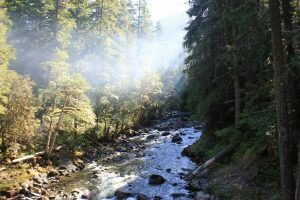 Being lulled to sleep by the rushing water and waking up to the fresh smell of pine is worth the price of admission. 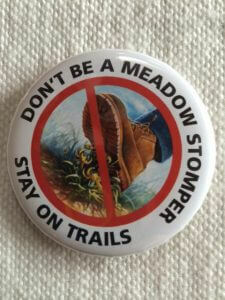 Plus, great trails are right outside your tent flap. No need to drive. When WWI cut off international travel and launched the “See America First” movement, Director of the National Parks, Steven Mather, set out to draw travelers to the National Parks. How? 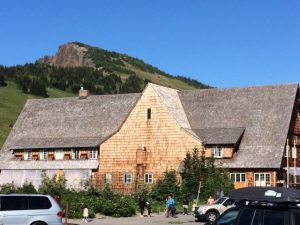 Luxury hotels, built in a Swiss chalet style that was nicknamed Parkitecture. 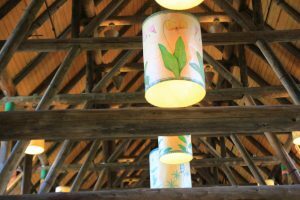 The beauty of architecture remains in the oldest NPS hotel, the Paradise Inn. 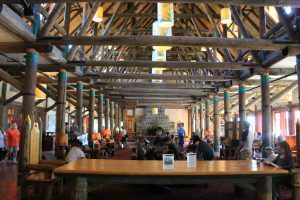 The lobby is grand, rustic, and cozy all at once. The luxury, well that depends on your definition. The rooms are not so much Four Seasons as Club Med, which means functional sleeping inside, luxurious scenery outside. Food quality throughout the National Parks system is uneven. I have had everything from a gourmet lunch at the Lake Yellowstone Hotel to this week a $10.75 Caesar Salad, so frozen I had to lay the lettuce out in the sun to thaw. So keep in mind, the luxury is: location, location, location. 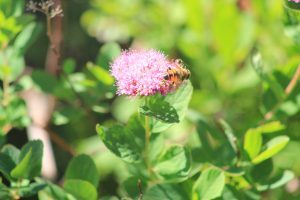 One great advantage of the Paradise Inn is that it eliminates the parking rat race because you’re just steps away from the wildflower trails. The Visitor Center exhibit at Sunrise lets you know that this volcano is still alive. Seismographs record tiny earthquakes while steam releases through vents. Some areas of the glacier are encircled by bare rock where escaping heat melts the ice. A sudden increase on the seismographs will serve as an early warning signal so everyone has a heads up to head out. Where else can you learn so much about your world in such an engaging way? The Park Rangers at Mt. 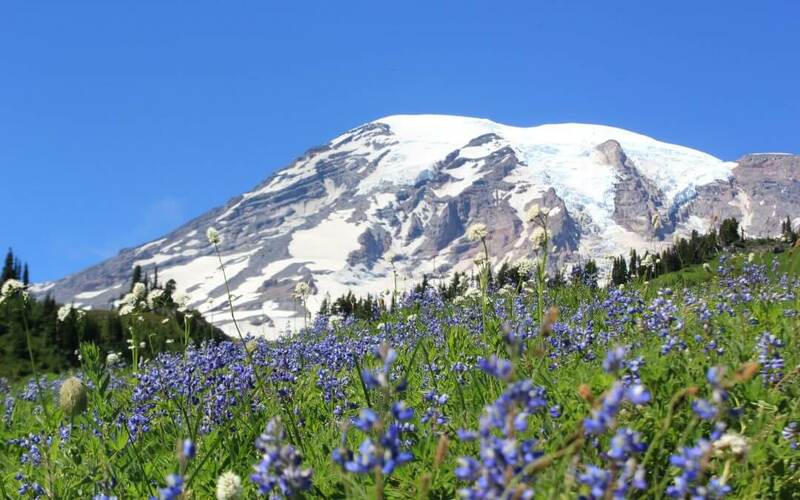 Rainier give you history, science, and conservation, all for free. 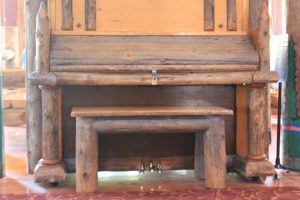 The Ranger talk at the Paradise shared the Inn history including its renovations, the first one to keep it from sliding downhill and the last in 2006, to retrofit it against earthquakes. This piano in the lobby provided the only entertainment in the snowy winter for the lonely caretakers, who had to exit the hotel through a third-floor window. 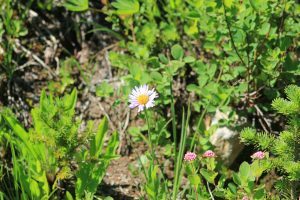 On the wildflower hike, Ranger Gwen not only named the flowers but gave us a free picture list and explained who eats what. 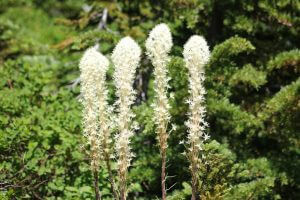 Bears love Beargrass. Marmots dine at the whole wildflower banquet, storing enough in their systems to get through the harsh mountain winters. Because the wildflowers are so crucial to ecological sustainability, the Rangers spend a lot of time asking people to stay on the paths. As they say in the Park newspaper, the magnificent wonders in this park didn’t happen overnight. Such beauty is hundreds or thousands of years in the making. Respect it. Mt. Rainier has changed its mission over the last 100 years, and next week I’ll explain what has happened and how citizens can get involved. In the meantime, leave your comments below. 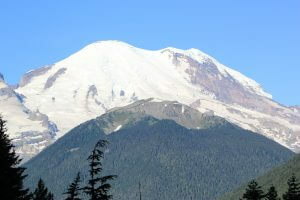 We are planning on going to Mr. Rainier next summer. Thanks for all the tips on where to go, and for the lovely photos to inspire! The photos and narrative, while superb, still do not adequately capture the totality of the experience of visiting Mt. Rainier. You must see it for yourself to absorb the reality of this massive geological wonder.